The restaurant scene in Łódź has become more and more varied, and eating out is possible even on the most limited budget. 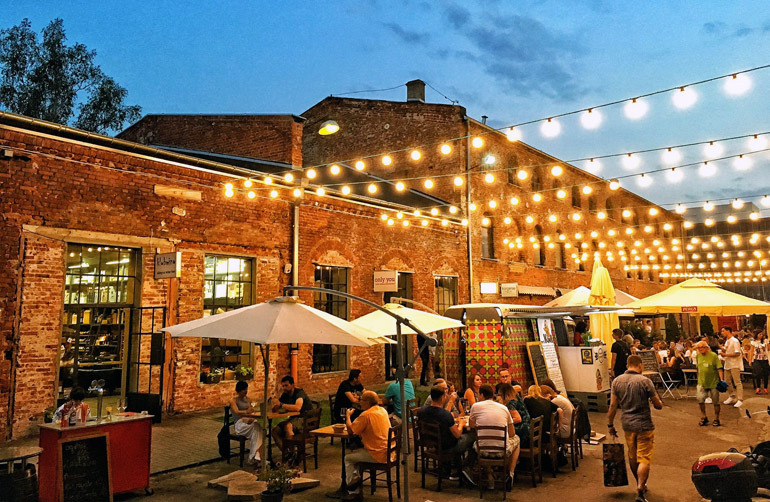 Whether you're a tourist or from Poland itself, there are plenty of options for all tastes – trendy spots such as Off Piotrkowska with its many pubs, clubs and bistros are a haven for hipsters, whilst Manufaktura shopping centre attracts families. And of course, milk bars and canteens are a great option for when you are really strapped for cash. You can start in one of Łódź’s milk bars. Bar Mleczny Kultura opened a few years ago, where once the famous Smakosz milk bar reigned supreme. When it closed in 2011, people said that it was the end of an era. Kultura draws from that tradition and advertises itself as a milk bar, even though it looks more like a modern hipster spot, with its brick walls hung with pictures by local artists and an ever-changing menu. It differs from traditional milk bars in that it offers mostly meat dishes and not the traditional pierogi, kopytka, and leniwe. You can find these in Stokrotka – located farther from the centre, at Łódź Widzew. It’s more old-school, but also offers a variety of home-made dishes ‘like your grandma used to make’. U Notariusza, located right in the centre near the train station, also offers cheap set menus every day. A typical meal will include a soup (rosół, tomato soup, gherkin soup, mushroom soup, or traditional potato zalewajka from Łódź), a main (cabbage rolls, pierogi, meatballs, and so on), a choice of potatoes, rice, or groats and a choice of Polish-style veg (carrots and peas, cooked beets, stewed cabbage, or fresh surówki). And if you really want to indulge in pierogi, try Pierogarnia pod Stępą – seven big, juicy pierogi with your chosen filling cost around 12zł. On a student budget it’s smart to go where other students go: to one of many canteens and eateries often located near academic campuses. Kapusta z Grochem (the name means ‘cabbage and peas’ – a traditional Polish side dish) concentrating on food from the times of Poland under the communist regime. Pierogi with meat, pork hock and kidneys are served here as well as more ‘original’ inventions of the time such as ‘crumbed bologna’. Not the healthiest of options, but definitely budget-friendly and satisfying. 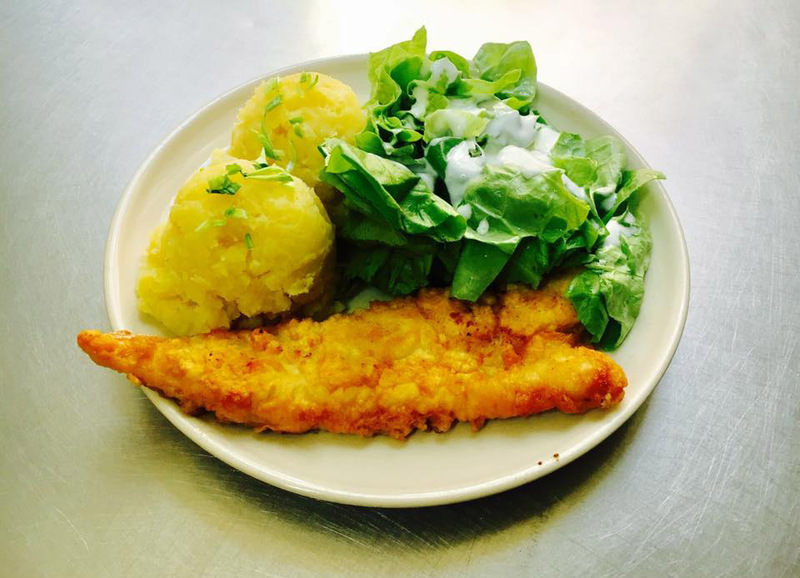 Serenissima, also located at the Polytechnic, offers healthier food, with tasty soups and main dishes consisting of a selection of meats (that you combine with potatoes, groats and veg), as well as vegetarian dishes such as pasta or lasagna. And if you really want to feel like a local student, check out Cotton Club – one of the symbols of Łódź Polytechnic. It opened more than 25 years ago and it’s been feeding students with pizza and sandwiches ever since. 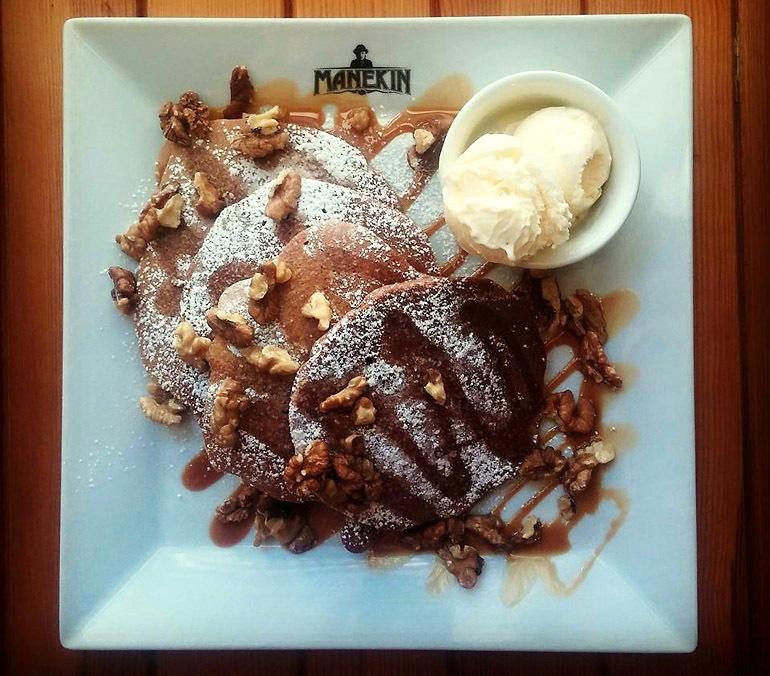 Manekin – a franchise of crêperies now open in seven Polish cities – is a real phenomenon. People sometimes stand in queues here for hours to enjoy a variety of crêpes, pancakes, soups and salads at reasonable prices. Pankejk, located in Manufaktura shopping mall, is also a popular spot for – you guessed it – pancakes and crêpes. You can get a nice meal there for around 12-13zł. Food trucks are also present: check out Bystro, which specialises in burgers and Przystań w Ortaköy (Ortaköy Harbour) which serves a variety of Turkish street foods – meats from the grill, fresh salads, and kumpir, Turkish jacket potatoes. Their mission is to prove that Turkish food is not just about kebabs. But when it comes to kebabs – there’s obviously a whole debate as to which ones are the best, so your safest bet is probably to look for the one with the longest queue. Located in Manufaktura, Zielona is an option for vegans and vegetarians from Łódź who have more and more interesting dishes to indulge in at a growing number of places dedicated to plant-based cuisine. This restaurant is probably the most elegant of them all, without being too fussy or too expensive – you can grab a mushroom or tofu burger here (for around 25zł, with fries), noodles with almond pesto and tomatoes, or gnocchi with mushrooms and truffle oil. Korzenie at Piotrkowska 217 also serve burgers as well as vegan pizzas, healthy stir-fries and colourful salads. There’s also the small burger joint Papuvege and the health-oriented Porcja, where you can try such interesting dishes as vegan omelette made of buckwheat and tofu and watermelon curry. Chain vegetarian fast-food spot Green Way on Piotrkowska is also a cheap and popular option. The story of Off Piotrkowska begins in 1889, when a spinning and weaving mill was built by business magnate Franciszek Ramisch. In the following years his business thrived and more buildings were built between Piotrkowska and Mikołajewska (now Sienkiewicza) streets. After the war, it continued to house a cotton factory. From 1999 various different companies rented the buildings, until in 2011 the Off Piotrkowska project began. 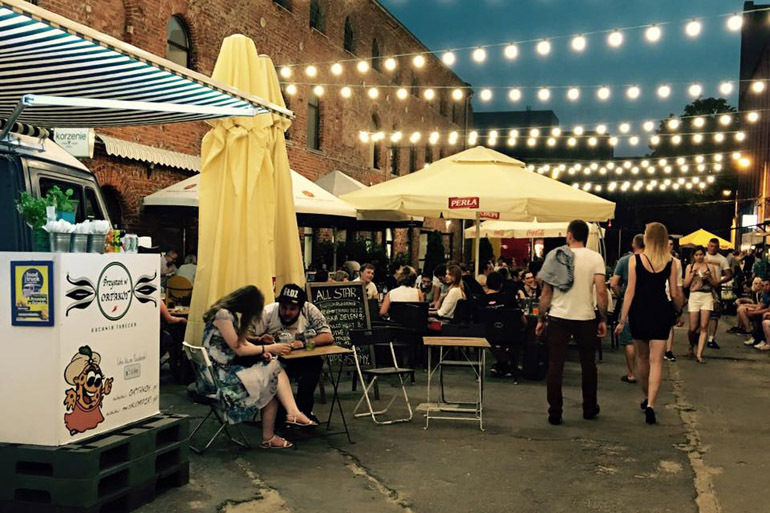 Now it hosts the best of Łódź’s design, fashion, music, and – of course – food. The most popular restaurants here are Drukarnia and Spółdzielnia – both not very cheap (10-15zł for a soup or starter, 25-35zł for a main), but very popular among young professionals and late-night clubbers looking for a quick bite or a selection of your typical big-city grub (think hummus, burgers, salads, pastas, and curries). 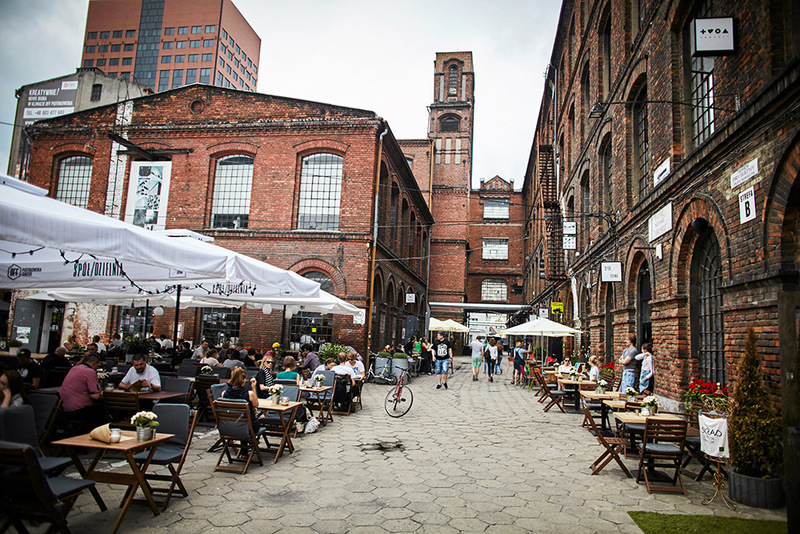 Another industrial spot dedicated to food, sometimes called ‘the second Off’, is Piotrkowska 217 where Before Food Market is organised as well as many special events dedicated to different cuisines. Thai ice cream? Hungarian lángos? Classy French cuisine? You got it! There are also a bunch of restaurants here where you can go without breaking the bank – apart from Korzenie mentioned above, also Chill Bistro & Bar is worth a try – they serve lunches for 18zł and have amazing desserts, such as goat’s cheese cheesecake with caramel ice cream.